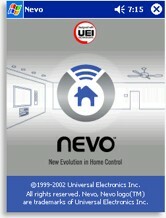 UEI's Nevo technology the task may be simpler than you think. The keyword for today is “convergence”: merging the functionality of one item into another seemingly unrelated device. So, your computer becomes your home theater; your cell phone becomes your Walkman; your refrigerator becomes your internet access device. And in this case, the Compaq/HP (whichever is correct today) iPAQ H3900 series of pocket PCs are planning on becoming your sole audio/video remote control. The idea of using a PDA (Personal Digital Assistant) or HPC (Handheld Personal Computer) makes sense, just like universal remotes: one small high-tech gizmo replaces a number of other lower-tech gizmos. As practical as adding this to an already valuable tool seems to be, it’s not an entirely new concept. Since the first handheld computer came off the line with built-in infrared, users have been figuring out how to manipulate them to work with their televisions and VCRs. Commercial-grade solutions have been available for several years now, the most successful being a software package for the popular Palm Pilot platform called OmniRemote. The sticking point back then (and even today) was that the Palm really wasn’t designed to be used as a remote control: it’s an information manager. Sure, software could be written to use the infrared port, but nobody had thought of A/V control during the Palm’s design process. So, not only was the port on the wrong end of the Palm – facing the user – but it was also designed for the high-speed/short-distance IrDA protocol, rather than the low-speed/high-distance CIR format used by modern A/V equipment, limiting its signal to a range of mere feet. Since so many people already owned Palms, who were willing to pay $20 or $30 to turn it into a remote, workable (if inelegant) solutions were developed. Software was written to work upside down, while users who didn’t want to control their equipment from an arm’s reach away could also buy a stick-on infrared booster designed to work with CIR. Today, several manufacturers are beginning to design handheld computers with remote control users in mind. These improvements take the form of both hardware, such as more powerful infrared emitters on the front of the unit, and remote-emulation software. 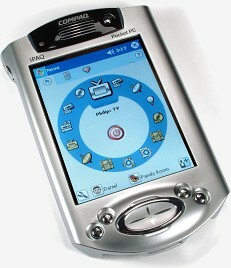 The Pocket PC-based Compaq iPAQ H3950 (and its more expensive sibling, the Bluetooth-enabled H3970) aren’t the first such units on the market originally designed to double as remote controls, but they do take the concept the furthest by using actual licensed technology incorporating a hardware chip. And then, there’s the other side of the coin, namely, why not buy a handheld computer primarily to use as a really really well-rounded remote? Sure, you may not be using the device to its full potential, but you could add games, DVD movie lists and important phone numbers – items that Philips Pronto users already find handy on their controls. Call it a remote control that packs a punch.